Diamonds are more popular than ever. According to insights on 2017 diamond jewellery industry statistics, consumers around the world are purchasing more diamond jewellery than ever before. Last year’s global diamond jewellery market value reached an all-time high of US$82 billion (approximately R1,1 trillion), which represents a two per cent increase on 2016’s numbers. The main driver of this growth, and the biggest contributor for four consecutive years, is still the U.S. diamond jewellery market, which makes up around 50 per cent of global spend. It’s not surprising that the world’s largest and most mature market is leading the way in the diamond industry’s global growth. But what might be unexpected are the diamond jewellery industry trends driving the growth in demand. Here is a glimpse of some of the factors behind the increasing popularity of diamond jewellery in the U.S. While a diamond’s timeless beauty and enduring value are still key in consumers’ purchasing decisions, new jewellery designs and trends are opening the U.S. diamond jewellery market to a broader, more adventurous buyers segment among women. 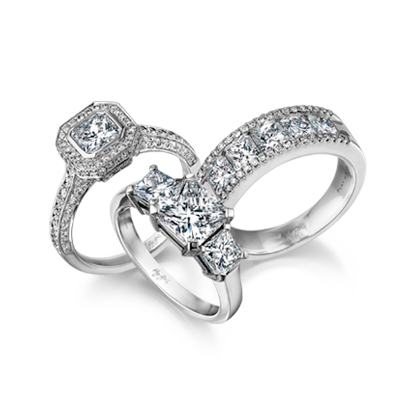 These new diamond jewellery styles go beyond engagement ring trends. Not only has it become normal for women to wear diamonds every day but the traditional minimalist style is making way for a new trend that could be called party jewellery – a style that favours an unusual look over carat size. These fun statement diamond pieces feature asymmetric earrings, mismatched stones, coloured diamonds and plenty of layering. Other unconventional jewellery items, such as triple-finger diamond rings, are also becoming popular. Although the giving of diamond jewellery as a token of commitment and love still makes up most purchases, there is an additional source of demand emerging. As women’s spending power increases, more women are buying diamond jewellery for themselves – whether to mark important personal or professional milestones, in recognition of their achievements or simply because they want to and can. This self-gifting trend is underpinned by a diamond industry analysis of key trends in the market when it comes to self-purchase. The insight report revealed that self-purchasing of non-bridal diamond jewellery items in the U.S. grew by more than 30 per cent between 2005 and 2015, and that 31 per cent of all women’s diamond jewellery bought in 2016 in the U.S., was bought by women themselves. According to Forbes there are 80 million millennials in the U.S. spending $600 billion annually (approximately R8 trillion), which amounts to 28 per cent of all daily per-person consumer spending. This generation, which has sometimes been considered ambivalent about diamonds, has actually been contributing greatly to the U.S. diamond jewellery market. The same report attributed a surge in diamonds’ popularity to this group of consumers, who make up a staggering 45 per cent of all diamond purchases across the most important global diamond markets, including the U.S., China and India. Millennials have not only been responsible for a significant percentage of diamond sales but have also been shaping diamond industry trends. Being in stark contrast to the older generation of diamond buyers, millennials require a unique approach when it comes to marketing and sales, which has been forcing diamond jewellery brands to evolve and adopt new strategies to harness these young consumers’ interest. Where older generations have been known to purchase diamonds to connote status, millennials care more about self-expression, which has been driving the development of new styles and design trends. Consequently, jewellery brands have been creating new collections more often to address these trends, which has been fuelling desirability and demand. Another millennial trait that is changing dynamics in the U.S. diamond jewellery market is the importance they attach to brand stories. Rather than buying an established brand name, millennials will rather align themselves with a brand they feel represents them – a brand with the same values – more often than not, a brand with a socially responsible mission. This means that diamonds that are transparently sourced with a “mine-to-market” story are growing in popularity. The younger fashion-conscious millennial market has introduced new diamond jewellery industry trends, which are impacting the way heritage brands market and sell diamonds. Customers seeking to acquire high-value items in a single click have been growing at a pace, which has been giving brands access to a broader customer base and contributing to the diamond jewellery market value. According to the Global Gems & Jewelry Market, By Type, By Region, Competition Forecast & Opportunities, 2012-2022 report, the global gems and jewellery market is projected to hit an all-time high of US$443 billion (approximately R6 trillion) by 2022, with rising online availability of diamond jewellery being mentioned as one of the driving factors. However, despite digital selling platforms’ huge pull, a recent survey found that 64 per cent of consumers who buy jewellery still visit a retail outlet during the research phase, which is 26 per cent higher than other luxury items. Respected worldwide for supreme artistry and innovative design, Shimansky has become one of the most recognised and sought-after jewellery brands in South Africa. And now, with a soon-to-be launched jewellery showroom on New York City’s famous 5th Avenue, Shimansky is ready to take the U.S. market by storm. With a number of jewellery design patents, and international diamond cut patents, Shimansky is set to become a notable contender for America’s fine diamond jewellery shoppers’ attention. Some of the most iconic designs include the signature Shimansky Millennium Diamond Engagement Ring and the world-renowned classic Shimansky My Girl diamond cut – the first internationally patented diamond cut to originate in South Africa. Visit a Shimansky showroom near you to find something that speaks to your heart, whether you are looking for a bespoke creation or one of the original collections.